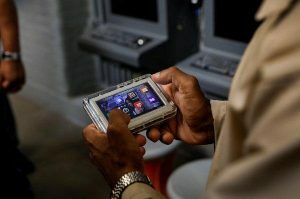 Hundreds of inmates in Idaho exploited the vulnerability in the personal tablets they were using to give themselves credits worth thousands of dollars to download games and music as well as use email services, said officials on Friday. The investigation by authorities showed that over 360 inmates had hacked into JPay system and made the balances of their accounts higher by close to $225,000 in credits, said a Idaho Department of Corrections spokesperson. JPay, a CenturyLink provided service, allows for the downloading of music and games by inmates to portable players, said the statement. The Department of Corrections, CenturyLink and JPay investigation found that inmates at five Idaho prisons increased credit on their accounts. Fifty inmates gave over $1,000 worth of credits to themselves, said the statement released by prison officials. One inmate was able to receive credits worth close to $10,000, which was the highest of any of the prisoners. The spokesperson called the inmates conduct intentional and not accidental, as it required knowledge of JPay system. The Department of Corrections in Idaho stressed that no taxpayer dollars had been involved in the hack and that no real money stolen. Inmates just gave extra credits to themselves allowing them to have access to email and entertainment. In a prepared statement, JPay said most people use the company’s secure technology in an appropriate manner, noting that it allows access by inmates to educational programming, different forms of entertainment and communication with family members. The statement said that in the case of the Idaho inmates, a number of them were found to have credited their own accounts improperly creating credits they could use to purchase more content, but once that issue had been discovered, it was immediately corrected. To date, over $65,318 in unsanctioned credits were recovered by JPay, and the inmates ability to download games and music has been suspended until JPay is compensated for its losses, said a DOC spokesperson. They still can both receive and send email. Those inmates, who had been involved in the scheme, were charged with disciplinary offenses which could result in the loss of privileges for a temporary period.